Window film is often associated with solar control, security and/or industrial applications. But there is a whole new side of window tint we would like to we would like to introduce you to and that is window film for decoration. 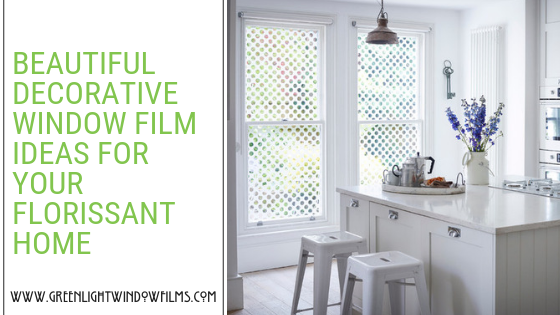 That’s right, today’s decorative films are more lovely than ever and can really be applied almost anywhere with a flat surface in your Florrisant home. Although decorative window film goes great on windows, doors, walls, dividers, and even cabinet glass are all viable too. Whether you just want to add a touch of class to a room or redo your entire design, decorative window film gives you the options you need to solve many different issues. So, if we have your creative juices flowing or you need a little help–explore the ideas we came up with below. Stained glass is lovely but pricey. Decorative window film, on the other hand, is cost-effective and allows you to simulate the beautiful color effects of stained glass perfectly. Decorative window film also gives you more design flexibility so you can try ideas that may not be possible on the traditional stained glass. Window treatments are always hard to match to your existing decor. But you need curtains and blinds to get even a modicum of privacy. Decorative window film is modern, sleek and fully customizable and gives you exactly the level of coverage you need on certain areas of the house (bedrooms, entryways, and bathrooms). Beyond just being beautiful, this type of application is extremely creative and unique and will get you those compliments you deserve! In areas like breakfast nooks, entryways, and bathrooms, you want a certain softly lite, ethereal look and blinds and curtains are horrible for creating that ambiance you are looking for. They are far too constraining both in style and function with limited colors and blocking natural light respectively. Decorative window film gives you that elegant diffused look you want and comes in a number of partially opaque textures like etched, cut, sandblasted, and textured glass. However, this application comes at a much lower price point than that of traditional patterned or sandblasted glass. The only limitation with decorative window film is truly your own imagination. Contact us at Greenlight Window FIlm today for more decorative window film ideas and to get pricing for your Florrisant home.